We are in unprecedented times. The Fed is reversing both its zero-interest rate policy (ZIRP) on the short-end of the curve, and quantitative easing (QE) on the long-end. At the same time, the yield curve is basically flat, and there is even talk about inversion. All this is starting to wreak havoc on the deposit portfolios of community banks. Many banks now find themselves with excessive loan-to-deposit (LTD) ratios, crimping growth and profitability. 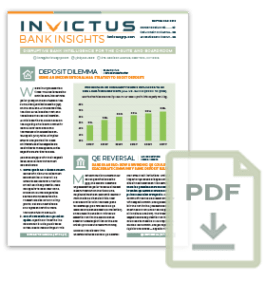 Rates on interest-bearing deposits are beginning to move upward, while deposits are starting to leave. Most community bankers know about quantitative easing (QE), the Federal Reserve’s unprecedented policy to reduce interest rates further out on the yield curve, helping stimulate an economic recovery from the 2008 Financial Crisis. They also are familiar with the Fed’s plans to reverse QE (also referred to as QE Reversal or Balance Sheet Normalization), announced in June 2017. This would essentially shrink the Fed’s balance sheet by close to $2 trillion by the end of 2021 (only about 3 years from now). Community banks should be educating their board of directors and staff about the differences between the new current expected credit loss (CECL) standard and the incurred loss model, which it replaces, regulators told banks on a July 30 Ask the Fed CECL call. At minimum, banks should determine the steps and timing needed for implementation, what method they will use to estimate their allowance, and what impact CECL will have on regulatory capital. Expect examiners to ask about how your bank is getting ready for CECL.